‘Team Elevate’ from Altrincham Grammar School beat stiff competition from teams from Parrs Wood High School in Didsbury, Ladybridge High School in Bolton, The Hathershaw School in Oldham and Levenshulme High School in Manchester with their idea for alleviating loneliness amongst elderly citizens. All finalists had already beaten hundreds of students from other schools in the North West to reach the final. Hosted at KPMG’s offices in Manchester, the competing teams pitched their ideas in a Dragons Den-style event to a prestigious panel of judges including Dean Rogers Govender, Dean of Manchester; Ahti Arshad, Director at Brooklyn Charles; Paul Heywood, partner at KPMG; Noor Ali, World Foods Manager at Morrisons; and Lord Lieutenant Warren Smith. Team Elevate will now progress to the Enterprise Challenge Grand Final in London on 4th May where they will compete against winning schools from the West Midlands, South East, Yorkshire, London and Glasgow for the chance to become national champions. Anne Earley, Mosaic’s North West Regional Manager, said: “Team Elevate wowed the judges with their brilliant idea but I have to say that the standard of all the teams was extremely high. I am very proud that the North West is home to so many brilliant young minds and I’m certain many will go on to be our business leaders of the future. 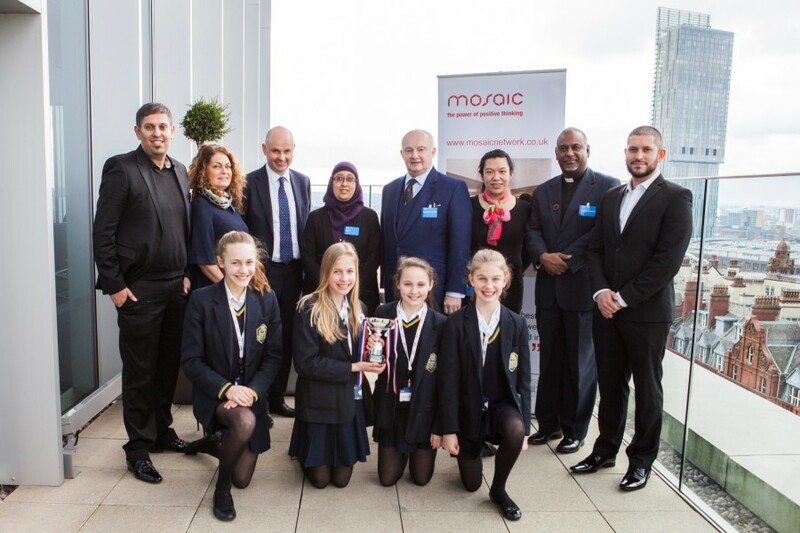 Run annually, Mosaic’s Enterprise Challenge is a national competition that aims to inspire knowledge, raise aspirations, confidence, self-efficacy and long-term employability among secondary school pupils. Supported by specialist, volunteer mentors from across the business community, students compete for six-weeks in an online business game where they must develop, market and sell a new product. The Enterprise Challenge is generously sponsored nationally by Apax Foundation and Qatar Charity UK and supported by Totem Learning. Nael Faragy is the principal regional supporter. The North West Regional Final had local author and restauranteur Helen Tse MBE as guest speaker. For more information on becoming a Mosaic mentor, please call 020 7566 8734 or email mosaic@bitc.org.